Today I have got you something different. Rahasya means secret. This movie is loosely based on Aarushi’s Murder case. This film has already met with lot of criticism and court drama before release. A case was filed by Talwar Family (Aarushi’s family) on its release by stating that film had lot of similarities with the real case. The film has been directed by Manish Gupta, Produced by Viacom 18 Motion pictures and Co-produced by UVI Film Products Pvt. Ltd. Roles: I am really impressed with casting of film. If you observe you will find all artists are playing their age. That’s awesome right? 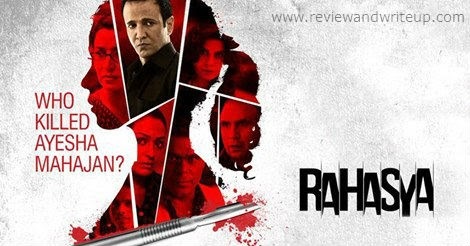 R&W Review: Sometime back I heard of a film which will be based on Aarushi’s murder case. When I was watching trailer of Rahasya I wasn’t aware that this is the same film. My first impression was that this film is based on that unfortunate case. I asked my sister to see the trailer; she also said the same thing. Trailer looks promising. Story has been weaved with perfection in trailer. It’s a murder mystery film and trailer makes it more mysterious. For one second you think Ashish is a murderer, and then he seems innocent. Tisca chopra was perfect choice I have to say for role of Aarti Mahajan. Kay Kay Menon never disappoints. He looks just perfect in this role. The film will be different from case as it’s clearly evident from the trailer. I am excited to discover Mita’s role in the film. Story seems catchy and will keep the audience in suspense. I am fan of mystery stories. Director has shot scenes in slight dark frame (darkness is base of any mystery). Strong star cast and plot of the film makes it worth watching. There won’t be any humor or item numbers. I am hoping that trailer hasn’t revealed too much (as it’s easy to get crux of film in teaser). It will be a good film, at least that’s what I believe by watching its trailer. Film is releasing on 30th January, 2015. R&W Recommendation: If you are planning to see a film this weekend then this film is sure shot option to go for. Another film is Hawaizaada. Both are releasing on same date. Film hasn’t got wide coverage because of low budget and absence of big stars in it. I don't think this has been promoted much. What you think of the trailer guys?